Raz Kletter. I’ve him in mind because I’ve just read through an essay to be published by SJOT by him and it’s fantastic and a fine reminder of why he’s a scholar you should know. He never disappoints. What are the chances that I’m going to get any game pieces that aren’t like the ones I’ve already gotten? That’s right, I’m expressing doubt as to the ‘randomness’ of this. Months after the Obama administration advised school districts that transgender students should be given access to bathrooms based on their gender identity, a federal judge in Texas has blocked the guidance from going into effect — for now. U.S. District Judge Reed O’Connor has granted a preliminary, nationwide injunction in response to a lawsuit filed by Texas and a number of other states. The preliminary injunction would mean that, until that lawsuit works its way through the courts, the “status quo” would be maintained and the guidance could not be considered enforceable. Mark Driscoll became furious over the weekend after spotting a new church plant which had popped up within a 5-mile radius of his recently-launched Trinity Church and decided to do something about it, according to sources. Waiting for the newbie pastor to come out of his church’s back door in the small business park where it is located, Driscoll reportedly jumped out from the bushes with a fierce yell, grabbed him by the collar, and shoved him up against the car. Driscoll the territorial…. so on the mark. Or more particularly, a new essay in ZDPV by Aren et al titled The Importance of the Donkey as a Pack Animal in the Early Bronze Age Southern Levant: A View from Tell es Safi / Gath. In this paper, we review the evidence for the use of the domestic donkey as a mode of transportation in the Early Bronze Age. The study will present the domestic donkey remains (artefactual and zoological) and their archaeological context from the Early Bronze Age III domestic neighborhood at Tell es Safi / Gath. The remains indicate the significant role that donkeys played in the daily life of the inhabitants. This reflects on our understanding of their role in the trade networks and mode of transportation that existed within the emerging urban cultures in the southern Levant during the 3rd mill. B.C.E. Get a copy. If you don’t have a car, get a donkey to bring it! Whoever trusts in his own mind is a fool, but he who walks in wisdom will be delivered. – Pro 28:26. The Ioannis Calvini opera quae supersunt omnia (59 volumes) is now on sale from the Bookstore and Antiquarian De Roo in Zwijndrecht, the Netherlands. The whole set of the Ioannis Calvini opera quae supersunt omnia consists of 59 volumes in 58 bindings. This particular edition is a facsimile edition of the original books from C.A. Schwetske and Sons in Braunschweig (1860-1990). These bindings are printed by the Johnson Reprint Corporation at New York and London. 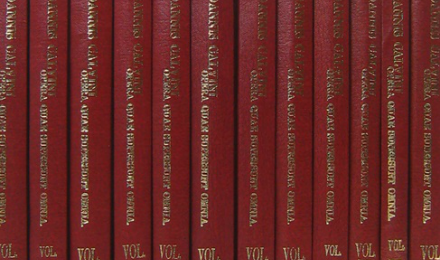 The books are uniformly bound in red imitation leather with gilt lettering. The entire collection is in excellent condition. PS- My birthday is in a week…. just sayin….